Atlantic Station’s debuting a Halloween attraction loosely pegged to Atlanta’s railroad history. “Containment,” a 25,000-square-foot, quarter mile long maze will be the largest haunted house inside the Perimeter this year. The attraction is being constructed entirely out of old cargo containers. As visitors make their way along a 1,300-foot path, live actors will terrify them at various stops along the way. According to “legend” (aka the back story posted at Atlantic Station’s blog) a collection of demonic artifacts ended up at Atlantic Station after a mysterious train derailment. Frightmares Inc., owner of the relics, collected all the cargo at the site and controlled the situation . . . at least until Halloween season. The teaser trailer is worth watching. It’s terrifying, suspenseful, and gives away few specifics about what the actual attraction will be like. 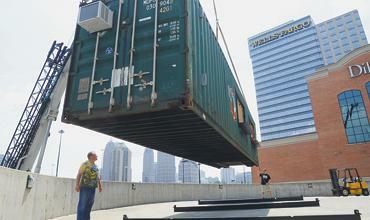 “Containment” will run October 4 through November 3. Stay tuned: Next week we’ll bring you a behind-the-scenes tour of the maze, and find out exactly what it takes to be a certified haunted house thespian.